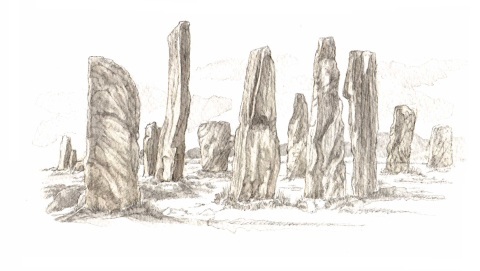 The Standing Stones of Callanish is on the Isle of Lewis, Outer Hebrides. This is one of the most impressive and the most remote stone circles, it is situated on the hill overlooking Loch Roag on the west coast of the island. It was erected 5,000 years ago for religious and magical ceremonies. In the centre is a giant monolith which is 5 metres high and underneath is a small chambered cairn. Surrounding this is a circle of thirteen stones, from this central point avenues of stones radiate north, south, east and west. From the air it resembles a giant Celtic cross, 120 metres long and 46 metres wide. Up until the 19th century local people still visited the stones to celebrate Beltane and Midsummer (even though the local minister forbade these gatherings) it was believed that it would not do to ‘neglect the stones’. At the dawn of the midsummer solstice a glowing figure walks through the northern avenue, this sight is preceded by the call of a cuckoo. The Grugach is a kindhearted guardian of grazing animals, leading them to water and protecting them from harm. 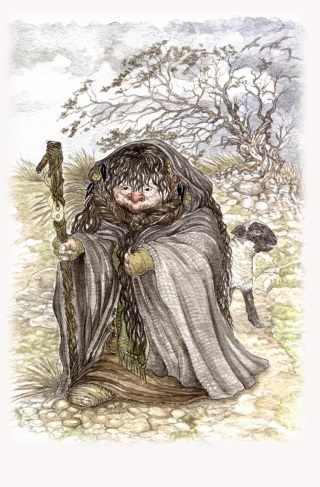 Although she is rather ugly she is always welcomed into crofters home so that she can seek warmth at their fires, as she also brings good luck with her.